You can specify a number of different values for the FontWeight property of a Control, to specify the thickness, or “weight” of a font. Each possible value is a request to the font for a different thickness. The number of distinct weights that you’ll get will depend on the font. Many fonts have just two weights–Normal and Bold. The weight value specified in the FontWeight setting is just a request. Windows will return a font whose weight best matches the requested weight. Below is an example with the Arial typeface. We request all ten different weights, but we see that there are only three different weights for Arial in Windows. Nope, I did mean DemiBold. When specifying FontWeight, you can use any of the static read-only properties from the FontWeights class. There is a DemiBold property, as well as a SemiBold property, but they are synonyms for the exact same font weight. (A value of 600 for the weight, in terms of OpenType spec). 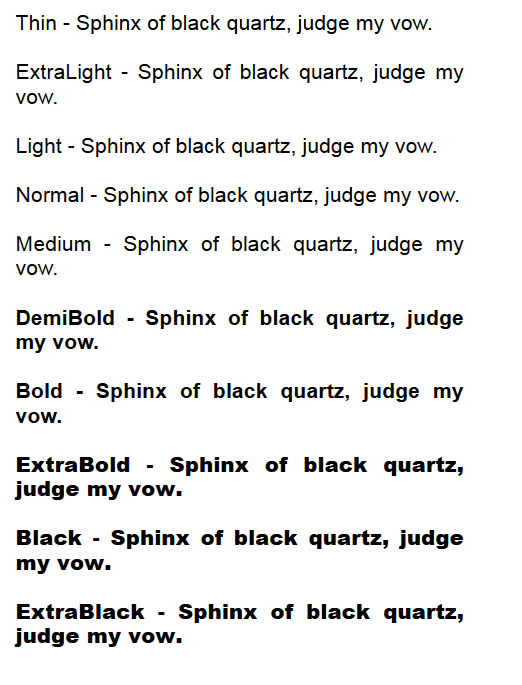 I wanted to simplify my example by using only one synonym for each possible font weight. The synonyms are there for historical reasons–some graphic designers use one term and some use another. (E.g. “Black” vs. “Heavy”). Your preferred term probably is related to which font designer/foundry you’ve gotten fonts from in the past. When a foundry designs and distributes a font, the font family will contain various actual fonts of different weights, and the foundry can call them whatever they like. 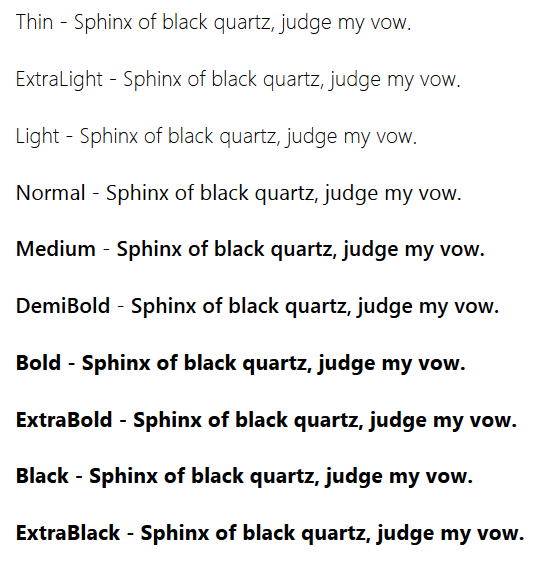 In the case of DemiBold vs. SemiBold, if you bring up the Fonts window in Windows 7, you’ll see a few of each. I tend to use the term “DemiBold” rather than “SemiBold”. I suspect that’s because I grew up in a typesetting family and am the son of a graphic designer who prided himself on identifying fonts by memory. So I use terms that were more common for the fonts that we had on our typesetting equipment back in the 1970s and 1980s. (Before desktop publishing displaced traditional typesetting). I think that ITC fonts tended to use “demi” instead of “semi”, as did Compugraphic. (We used fonts from both companies, which I believe are now all owned by Monotype). Actually, my Dad grew up learning to handset letterpress type and he probably used font terminology that dated back to the fonts in use in the 19th century or earlier. I probably brain-dumped more info than you expected, but I find typography fairly interesting and the history of typography even moreso, given that it predates personal computing by several centuries. Take a look at http://graphicdesign.spokanefalls.edu/tutorials/process/type_basics/design.htm for a nice overview of typography basics.